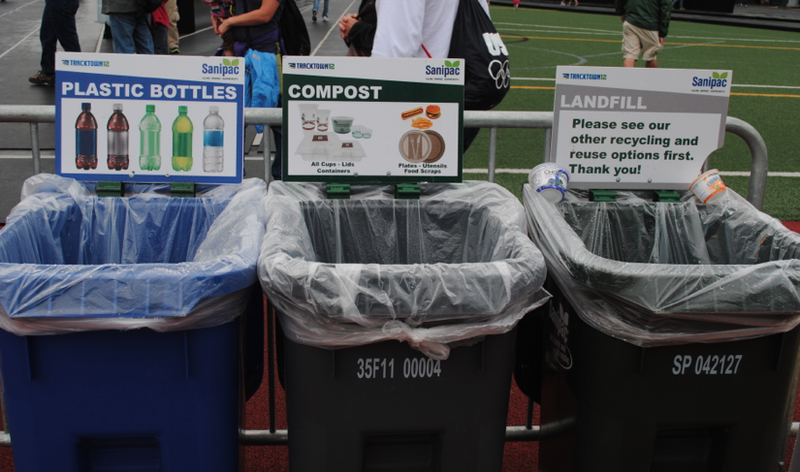 The Olympic Trials for Track and Field. With school out for the summer, I am in Oregon for the next two months with my parents and the kids, and Ken is going to be back and forth from New York. New York has the Yankees, Mets, Knicks, Rangers, Islanders, Jets, and Giants. 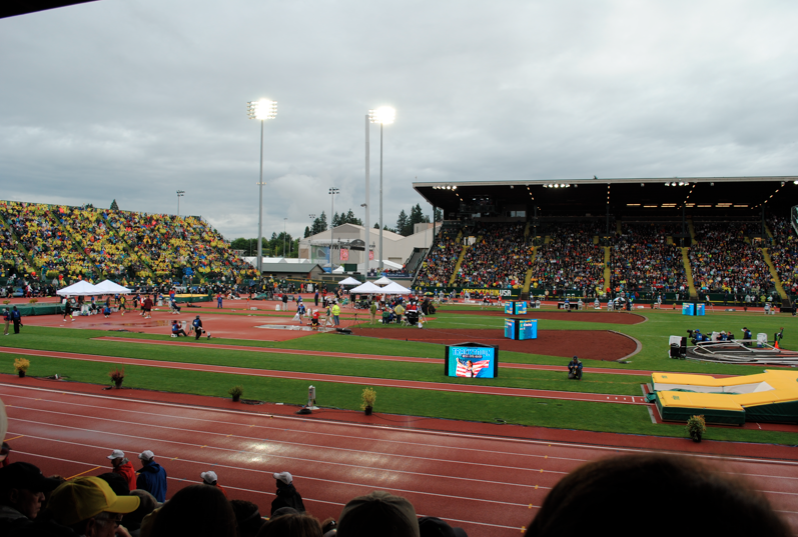 Eugene, Oregon has the Track and Field Olympic Trials! 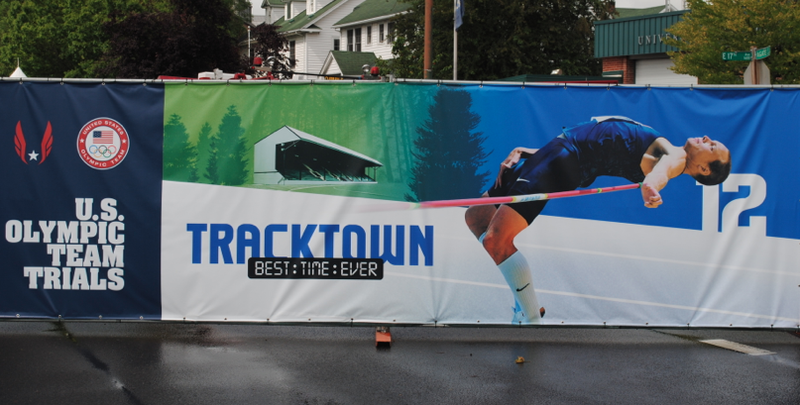 Eugene is actually known for its track (nickname: Tracktown, USA). 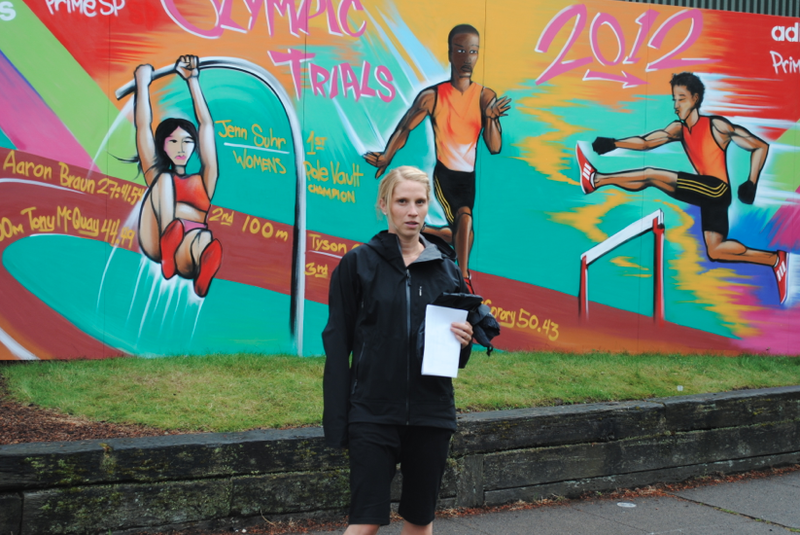 It is the home of Prefontaine and is where Nike was born. 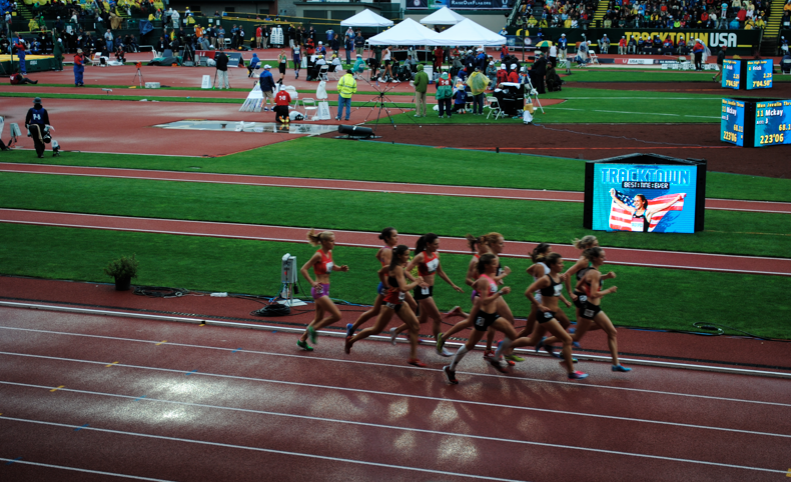 Even if you don’t love track (I do), watching Olympic Trials is pretty cool. Hundreds of athletes from around the U.S. come here after training for years. 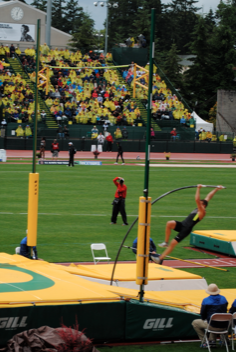 What transpires at Hayward Field determines if all of the blood, sweat, tears, and sacrifice are worth it. Lots of emotion, suspense, drama, and great track and field. Enjoy the pics! 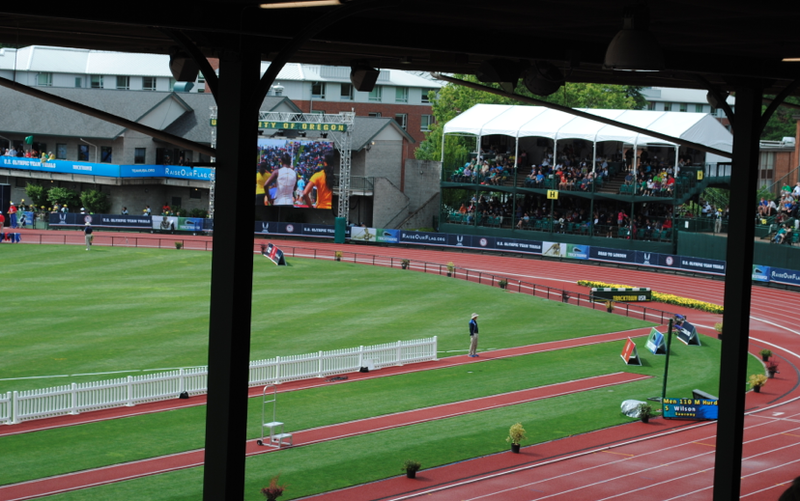 Hayward Field. Big crowd. Despite the rain. Women's 5000 meter. Can I please have their abs? Thank you. 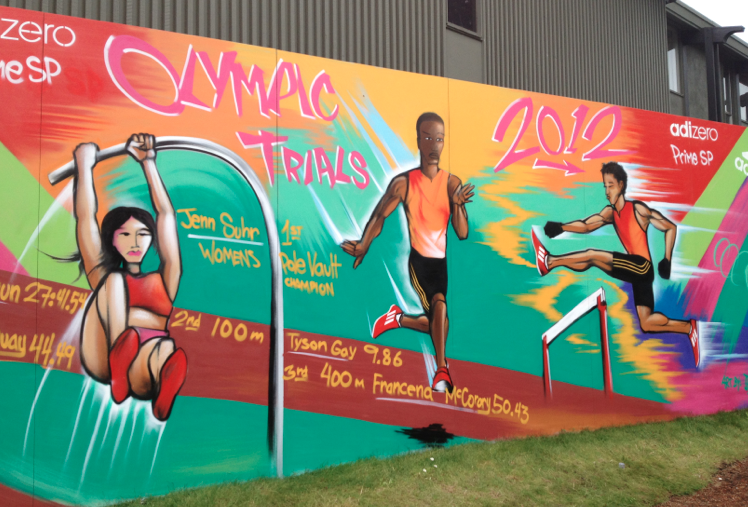 Here are THE people to watch for in track and field in the upcoming London Olympics. Allyson is not only FAST but she is a beauty star too, being featured in magazines of all sorts this past year. Shape, Glamour, Vanity Fair…her figure is sculpted and chiseled and we all wish we could look like her. Her run is the 200 m, but she also competes in the 100 m, and 400 m. She was actually in the tie for the 100 meters, that took place earlier last week. 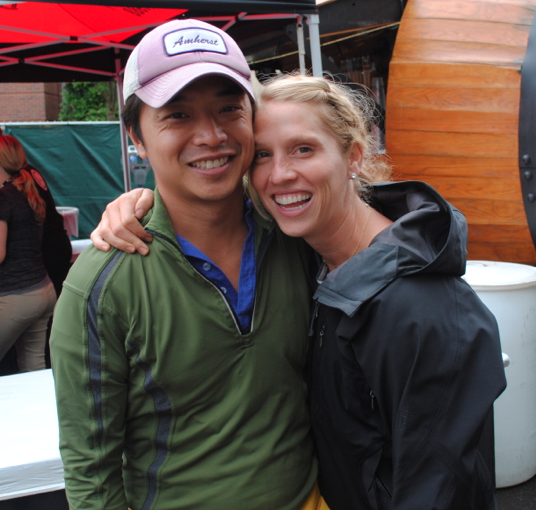 Allyson competed and won medals in the past two Olympic Games — Bejing and Atlanta. 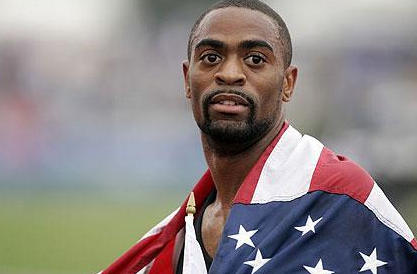 Another American sprinter, his events are the 100 and 200 meter sprints. 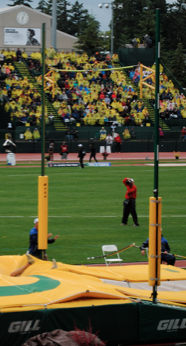 Although a competitor at Beijing, he did not win any medals due to an injury. He currently holds the record as second fastest man in the 100 meters. He can run 100 meters in the time it takes me to walk one step! HOLLA! Raise the roof, Lolo. Although Lolo is almost as well known for her looks and her abstinence, she is an incredible hurdler with the hopes of winning a medal this summer in London. The big joke is that Lolo wants to invite New York Jets quarterback Tim Tebow to church. 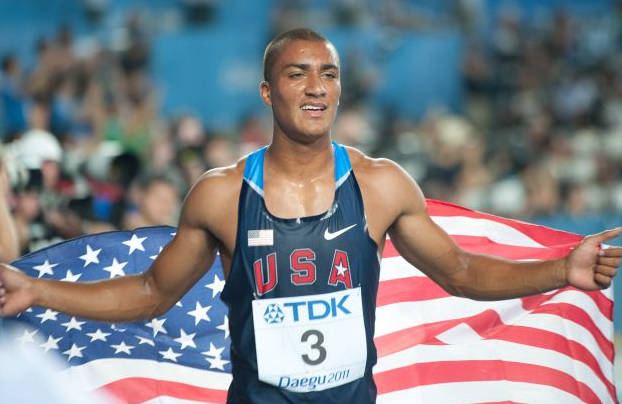 Ashton Kutcher...I mean Ashton Eaton. 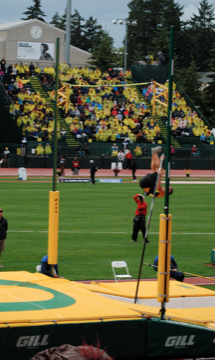 An athlete based in Eugene (whaddup Eugene! 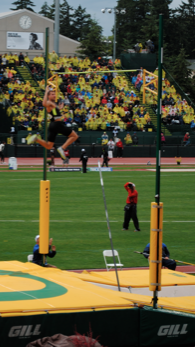 ), Ashton will compete in London in the decathlon. 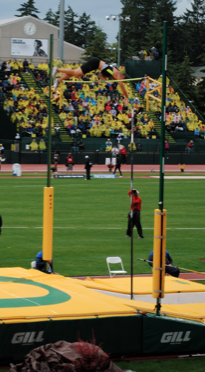 The decathlon is a combined event that features 10 different events (100 meters, long jump, shot put, high jump, 400 meters, 110 meter hurdles, discuss, pole vault, javelin, 1500 meters). DANG GIRLS, basically, if you win the decathlon, it shows that you are king because you are good at everything. KING OF THE WORLD. Go get ’em, Ashton. 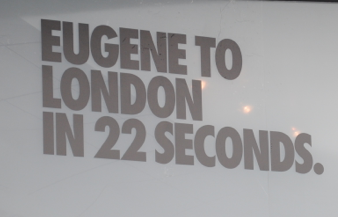 Represent Eugene! Here are some more pictures of us and the family attending The Olympic Trials. Nothing says "fashionista" more than a raincoat. 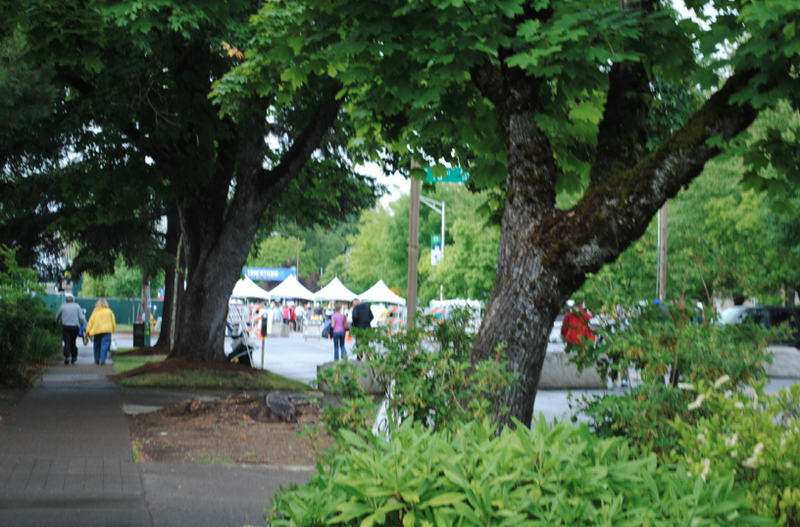 Entry into The Village on a summery June day in Oregon....which means rain. Really, Oregon, REALLY? RAIN?!?!?!?! The view from our seats. Nose bleed seats. 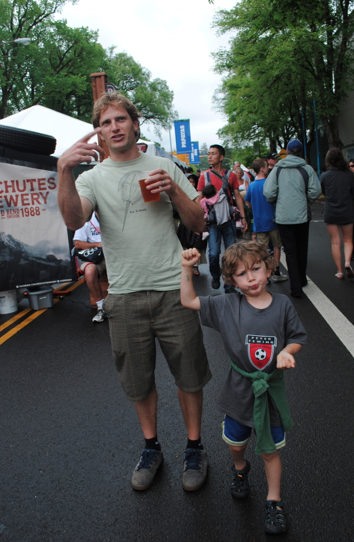 People of all ages had fun at the Trials, including my six year old nephew, Axel. Check out his hair. The Proskurowski Natori family knows how to rock the hairdos. Cruzzie with his bowl cut and Axel with his crazy-surfer-dude-forgot-to-wash-the-hair look. 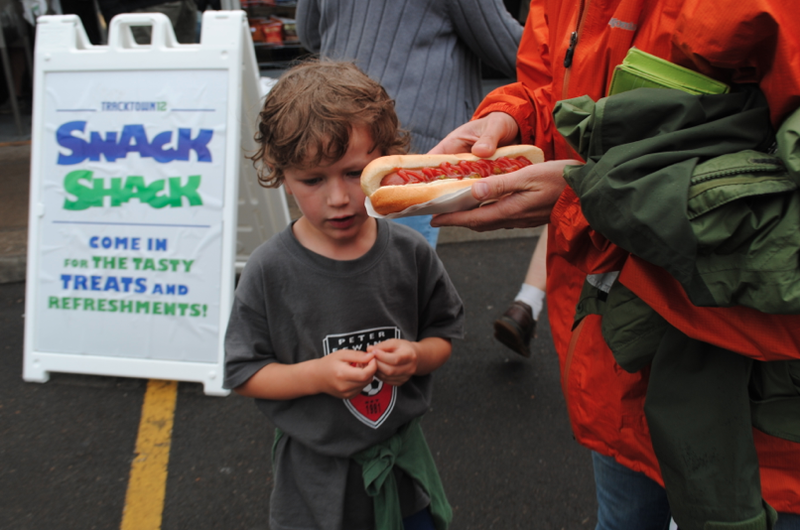 Hot Dog eaten by a HOT DAWG. I am off to my first session at CrossFit! I am so excited! 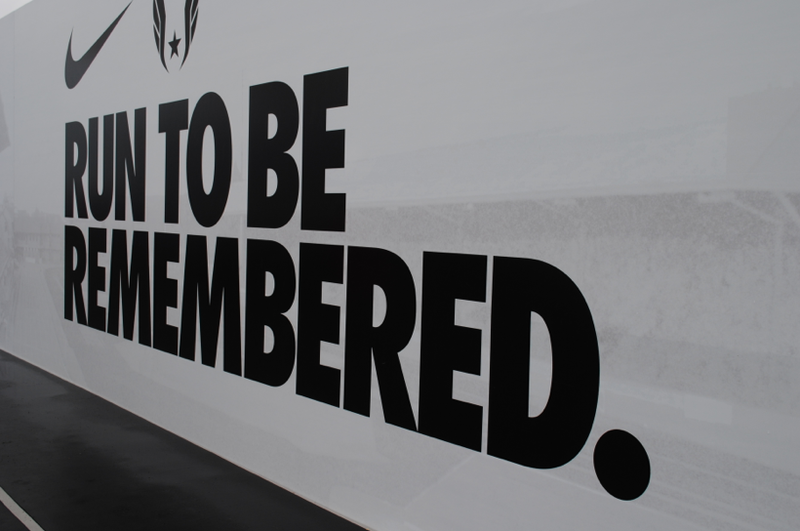 Will definitely fill you all in with my new workout experience…until then, have a great start of the week! Proud to be a hippy dippy. I love the Olympics and can’t wait for them to air. All of the trials have been great. Looks like you had fun! Was super fun and I can’t wait for the Olympics to get going! But now, I can watch Wimbledon, so I am happy either way! HUGE fan of Lolo Jones!! YAY Olympics! Did you watch the swim trials? Katie Ledecky makes the Olympic team at age 15.. AMAZING!!! I did watch it, actually. Which was the only hour of swimming that I watched. I love how NBC does all the back stories and gets you hooked! We’re a bunch of volunteers and starting a new scheme in our community. Your site provided us with valuable info to paintings on. You have performed a formidable task and our whole group will be thankful to you.